Holders Greetland will host Halifax AFL champions Shelf FC in a mouth watering quarter-final clash in the Skircoat Green Physiotherapy Challenge Cup. 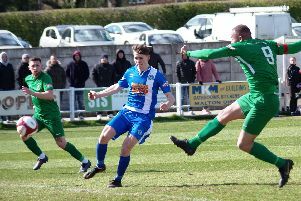 Greetland overcame a difficult first hurdle when they came from a goal down to win 4-1 away to early Premier Division leaders Midgley United on Saturday. They will be grateful for home advantage on October 27 against Shelf, who swept aside visitors Salem 8-1 in the first round. Northowram upset division-higher Calder ‘76 two days ago and will face another Calder Valley side in Hebden Royd Red Star, although this time they will have to travel. Sowerby Bridge, bidding to go one better than last season when they let a two-goal slip and lost 3-2 to Greetland in the Shay final, will fancy their chances of progress away to Copley United. Shelf United have impressed since an opening-day setback and will start favourites away to Illingworth St Mary’s, who also play on an artificial pitch. DRAWS - Skircoat Green Physiotherapy Challenge Cup: Copley United v Sowerby Bridge, Greetland v Shelf FC, Hebden Royd Red Star v Northowram, Illingworth St Mary’s v Shelf United. Covea Insurance Invitation Cup, second round: AFC Crossleys Res v Warley Rangers, Calder 76 Res v Elland Allstars, Flying Dutchman/Sun Inn Rastrick v Shelf FC Res/St Columbas, Midgley United Res v AFC Crossleys, Mixenden United v Illingworth St Marys Res/Northowram Res, Sowerby Bridge Res v Elland United, Sowerby United Res v Hebden Royd Red Star Res, Stainland United v Greetland Res. Matches on Saturday, October 27 (1:45pm).